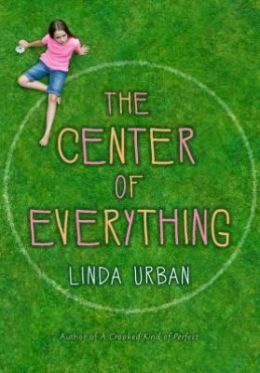 The Center of Everything by Linda Urban. Houghton Mifflin, 2013. Currently available. Age Level & Genre: Middle grade realistic fiction. Face Value: Nice. It’s simple and features a real-looking, whole-bodied girl. It may not be the most eye-catching of covers, but it is a sound, age-appropriate choice. Does it break the slate? Yes, it does, in a subtle way. Ruby is not the boldest girl in the story. Her outgoing best friend Lucy takes that prize. Ruby is unassuming and decidedly average. It is her efforts to repair damaged relationships and her extreme empathy that make her Slatebreaking. Ruby does everything she can think of to try to fix what she has done wrong. Who would we give it to? Quiet girls and introverts will love, love, love this book. I did. Linda Urban totally gets introverts and their thought processes. Maybe she’s an introvert too! Review: It’s time to start talking Newbery, my friends, and this book is on my list. The Center of Everything is a cozy story. Urban’s narrative is pitch-perfect. She has crafted a vivid setting for an extremely interesting girl character, and every word is placed in a way that draws you in. The Center of Everything takes place in Bunning. Bunning is a small town that is extremely proud of its history. It was founded by Captain Bunning, a seafaring man who accidentally invented the donut. Thus, donuts and the Bunning Day parade are major highlights of life in the town. Ruby Pepperdine has grown up in Bunning, and her family is deeply entrenched in the community. Gigi, Ruby’s grandmother, was a beloved community activist and business owner. Gigi was also Ruby’s role model. Ruby adored how Gigi was confident, caring, and always knew what everyone needed. After Gigi’s death, Ruby is left reeling. She feels that she is the only one still grieving, while everyone else in her family and in the town has moved on. It is the way in which Ruby copes with her silent grief that makes her such a wonderful girl character. She is a clever young woman, and she looks for loopholes in reality that might make Gigi come back. Of course, Ruby is old enough to know that she can’t bring her grandmother back to life – but she has just enough hope to try whatever she can. Ruby’s relentless optimism is refreshing, especially since I tend toward pessimism, myself, and can learn a lot from characters like Ruby. Ruby is shocked when she wins the Bunning Day essay contest and finds herself in the heart of the town’s annual Bunning Day celebration. It is this quirky celebration and its many layers that frame Ruby’s central mission: to just get a few more moments with her grandmother. Ruby’s desire is so earnest that it’s almost heartbreaking. There is no outlandish plot in this story, and no zany characters. The Center of Everything is really just a simple story about a girl who desperately misses her grandmother. Yet Urban’s writing makes this book special. The author incorporates this lovely strategy where she highlights the lives of other interesting characters in Bunning, and then connects that character back to Ruby’s life. Reading this book is akin to navigating the web of connections that tie everyone together in a small town. I predict we’ll start seeing a shiny round sticker on the cover in a few months. This entry was posted in Middle Grade, Reviews and tagged grandparents, Grief, Loss, small towns. Bookmark the permalink.